Ideal for school groups and assemblies, Grades K-6! Your Pow!Science! Instructor will lead your "big" group through an exploration of science, experimenting the whole way. All materials will be provided by Pow!Science! and all experiments are safe. 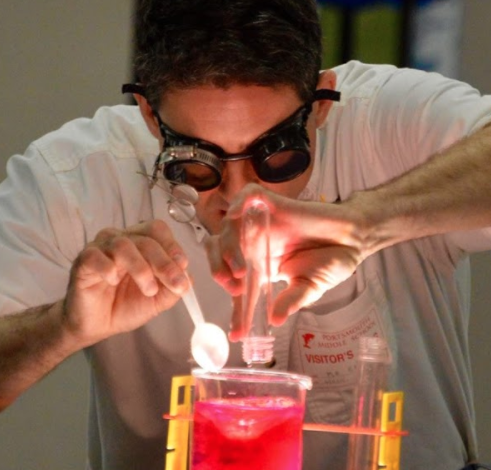 Science Asks Why is a traditional "big audience" show but it is also an evolving program - new experiments and demonstrations are added each year, keeping the presentation fresh & exciting! The show lasts 45-50 minutes. In addition to the science, kids will learn about the importance of curiosity itself, and why a day shouldn't go by without trying to figure something out. All programs are conducted in RI and nearby MA during regular school hours. This is not your ordinary Assembly - Pow!Science! Master Builders will bring thousands of precision cut New Zealand Pine building blocks & spend 4 to 5 hours at your school as each grade level cycles into the room for 25 minutes of hands ON, age appropriate engineering! Younger students will learn and practice principles of balance & building, older students will learn about ratios and the importance of Engineering systems, all the while building towers, bridges and buildings that will turn your venue into a wooden wonderland. Go beyond the typical "Sit & Watch" Assembly! There is a better way!